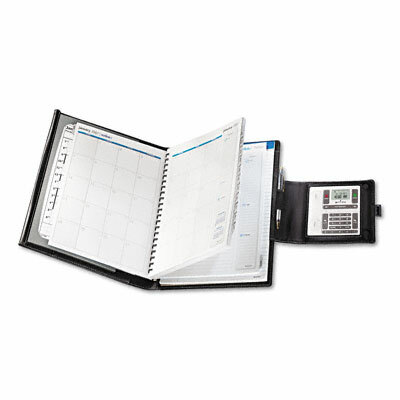 Monthly planner with smart tools for efficiency and productivity. Simplify your life by streamlining the transfer of information from your computer to paper and back again. The Task Pad organizes your notes for easy transfer to computer and enables you to capture e-mail addresses, contact names and phone numbers. The Document Tray has a hard surface for writing or holding printouts of your computer calendar, contacts, tasks or e-mails. The Pop Up Reminder alerts you of your appointments in advance and acts as calculator. Tabs for quick access to months. Monthly planner with smart tools for efficiency and productivity. Simplify your life by streamlining the transfer of information from your computer to paper and back again. The Task Pad organizes your notes for easy transfer to computer and enables you to capture e-mail addresses, contact names and phone numbers. The Document Tray has a hard surface for writing or holding printouts of your computer calendar, contacts, tasks or e-mails. The Pop Up Reminder alerts you of your appointments in advance and acts as calculator. Tabs for quick access to months.